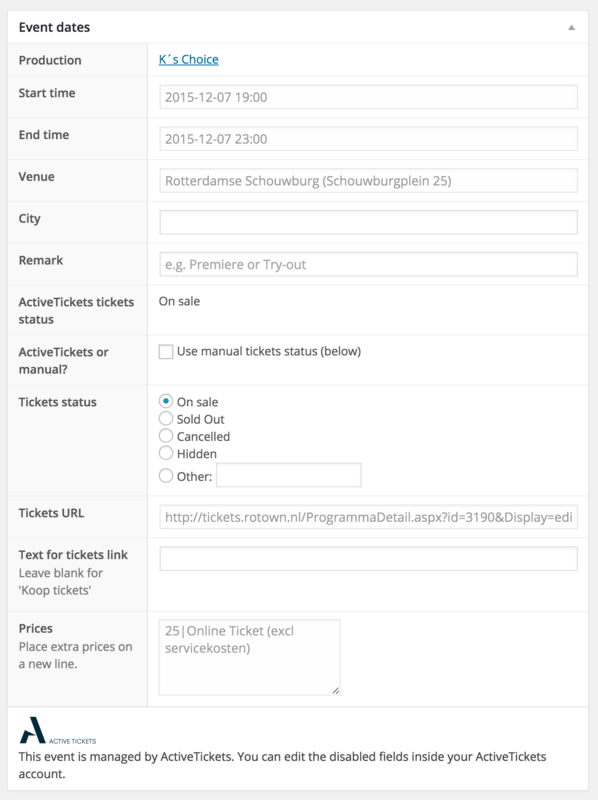 Automatically import your ActiveTickets events and sell them on your WordPress website. This extension to the Theater for WordPress plugin automatically imports your events from ActiveTickets and shows them on your website. You can add additional information like texts or images directly inside WordPress. Tickets sales happen inside the default payment screens of ActiveTickets. Install the ActiveTickets for WordPress plugin. Enter your username on the ActiveTickets tab in the Theater for WordPress settings. Send the IP number of your website to your contact at ActiveTickets so they can activate the import. ActiveTickets is a popular ticketing solution in The Netherlands with solutions for theaters, music venues, movie theaters and festivals. We work with Jeroen for a number of clients and he created a smart WordPress plugin for ActiveTickets. Perfect for venues. You can basically achieve great results on a small budget. Definitely! Check out the websites of Rotown in Rotterdam and Lingefilm in Geldermalsen.